The vinyl record is my preferred media for active listening to recordings made in the 1950s and into the 1980s. As discussed earlier, analog recordings played back on vinyl records add a certain amount of their own “noise” to the listening experience. Some of this noise is not desirable such as the tics and pops associated with a record that is no longer in mint condition. But it also adds a certain “warmth” and “life” that is missing from CDs. Listening to vinyl as opposed to a CD is like looking at the paint on your car before and after you wax it. Vinyl sounds like a fresh wax job looks. It didn’t change the basic color but it enriches it making it fuller and more vibrant and full of life. Ultraviolet light is not visible to the human eye, but if you place an ultraviolet filter in front of your eyes you can see the difference made by removing ultraviolet light. I think of CDs as possessing a filter that does not allow all of the “colors” of the audio spectrum to be heard. Perhaps that is good, or perhaps it is bad, but it is different, and I prefer the full spectrum of sound that vinyl provides. The CD specification stops abruptly at 20,000 cycles per second (20 KHz) whereas vinyl can reach all the way up to 45 KHz and beyond. Sounds above 20 KHz are simply not present on a CD which is OK in itself since it is above the hearing range that most humans can hear. But that does not mean that the sounds above 20 KHz do not affect the sounds that are within the audible range. These higher tones can reflect tones back into the audible range. This has the effect of enriching the sound that we can hear. An imperfect analogy is to take a pure 440 Hz tone and compare it to its equivalent primary pitch on a piano which is referred to as A-440 (A below middle C). A pure tone of 440 Hz is dull and lifeless. The same fundamental tone on a piano causes many other “sympathetic” tones to be heard and for harmonics of the 440 Hz string to be amplified or augmented by other strings on the piano. So these inaudible pure tones above 20 KHz that are present on a vinyl record do have an effect on what you hear when playing back a vinyl record by affecting or generating tones that are audible. One last augmentation should be mentioned and that is the sound that you hear when playing music back through a tube based preamp and amplifier when compared to transistor based amplifiers. Again, it adds “color” to the sound which you either like or not, but I do. Like you, I prefer analog over digital, i.e., the sound of my 60s and 70s LPs over re-releases on CDs of the same artists and titles by the same companies. As you say, it’s a warmer, richer sound. Often the stereo image also is better, and some of the finer details more distinct. But I hadn’t really known some of the technical reasons that you provide, particularly the super-20 KHz bounceback. I like your ultraviolet light filter and piano analogies. Having said that, I say that I said that I PREFER LPs, not that I typically listen to them. 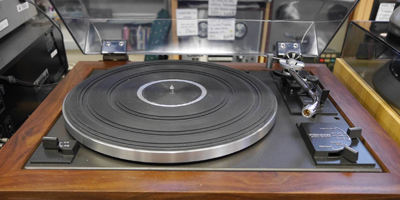 The catch-22 of LP-listening is that listening to LPs to hear the best sound wears the LPs out, so that eventually they no longer give the best sound. Even with high-quality styli the LP will suffer destruction, even if only the least bit, which repetitively adds up. So generally I satisfy myself with iTunes and WMAs and reserve the LPs for worthy occasions and purposes. Having mint LPs and not using them is a great waste, but then, deriving full use of them consumes them. What are you gonna do. BTW, I think all the analog vs. digital arguments can be extended to video. I much prefer the display of a CRT monitor to that of an LED. You hit the nail on the head! Records will eventually wear out if you play them enough. But if you maintain your equipment properly, with proper attention to the replacement of the stylus, this can be minimized. But beyond that lies an answer! Back in the day it was common amongst the most caring of music aficionados to record their favorite albums onto a high speed reel to reel tape. Then you could play your record album just one time while recording it and thereafter listen to the tape. Alas, tape wears out eventually as well and an occasional “refresh” was in order. For those who think down upon analog magnetic tape, keep in mind that (back in the day) everything was recorded and mastered using high speed reel to reel tape in the studio before it was pressed to vinyl. So if your reel to reel machine was of sufficient quality the sound quality suffered very little. Home and professional quality reel to reel machines that were of sufficient quality were not cheap, but when an audiophile had a very good one, it was a sure sign that this guy was serious about the quality of his sound and about maintaining his record collection in top condition. So what is “sufficient quality” for a reel to reel machine? The goal of any tape recorder is to pass as much tape surface under the record/playback heads as possible. This means that wider tape is better and faster speeds are better. Practically speaking this means that the tape is 1/4 inch wide and runs at 15 inches per second. Typically a ¼ inch wide tape is segmented into 4 tracks: a left and right stereo recording in both directions on the tape (reversed for playback on the other side). Better was a 2 track machine that used the entire surface of the tape in one direction. (This doubled the surface area). So 2 track at 15 IPS (Inches Per Second) was and still is the best you can do. ( Most common reel to reel machines are 4 track and run at 3 ¾ and 7 ½ IPS). This would yield a wonderful reproduction of the original LP. In contrast, a cassette recorder uses a 1/8 inch wide tape at a speed of 1 7/8 IPS. While this did not provide sufficient quality for audiophile playback back in the 1960s and 1970s, improvements in the quality of the tape itself brought cassettes into the audiophile realm by the late 1980s with super high density metal tapes. So are the best quality cassette recorders using the best quality recording tape capable of reproducing the sound of records sufficiently well? In a word, Yes! But don’t confuse this with a common “store bought” cassette as these did not use the best quality tape and were generated using high speed duplication machines.